Courtesy of Miguel Arrobas for Nadar Açores. 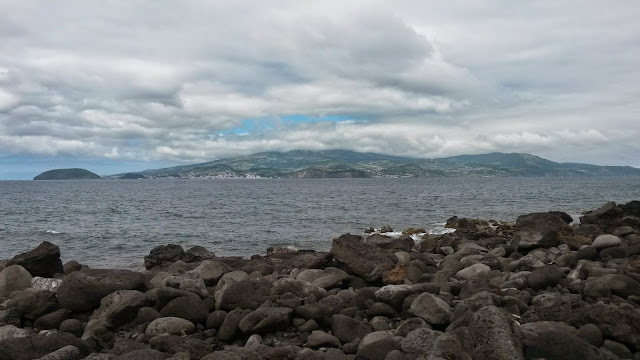 On August 2nd, 9 swimmers completed the swim between the islands of Pico and Faial in the Azores Archipelago about 1,360 km (850 miles) west of continental Portugal. This crossing was the first organized by the Nadar Açores (Swim Azores) project and covered a distance of approximately 4.5 nautical miles. It all started when the Azorean swimmers Vítor Medina and Nuno Braga, inhabitants of the Terceira Island in the Azores, invited channel swimmer Miguel Arrobas (English Channel, Strait of Gibraltar and Manhattan Island Marathon Swim) to join them in this crossing, which has only been completed twice before by swimmers in 1929 (Manuel Azevedo Lima in 3 hours 20 minutes) and 2008 (David Yudovin in 2 hours 20 minutes). 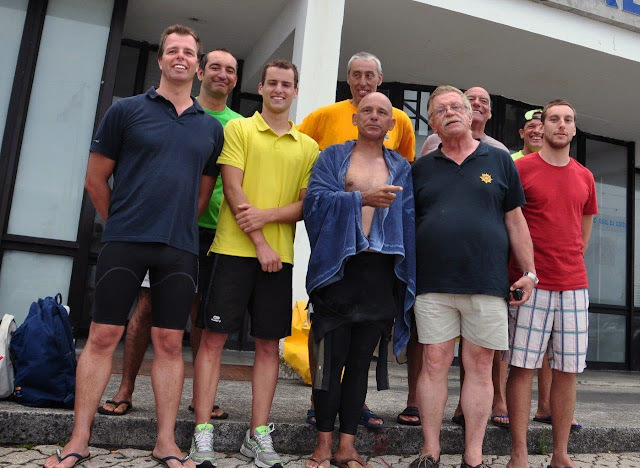 The core idea was to include swimmers who represent each of the Azorean islands. Additional swimmers were invited, but in the end only athletes from the islands of Terceira, Faial and São Miguel were able to participate. The historical reports of swim crossings of the channel separating Pico and Faial are scarce in either direction, but the American Yudovin, who completed several crossings between islands of the central group of the Archipelago in 2008 (Faial-Pico in 2 hours 20 minutes, Pico-São Jorge), and Corvo-Flores from the western group, recently put these mid-Atlantic Islands on the consciousness of contemporary channel swimmers. The Pico-Faial Channel is renowned for its natural beauty, a common trait among the Portuguese islands in the middle of the Atlantic Ocean. The crossing presented challenges ranging from ocean swells and strong winds to the presence of stinging jellyfish (Pelagia noctiluca, mauve stinger). On the day of the attempt, the wind and waves were strong and made the crossing much tougher. On the positive side, the jellyfish were not in the channel, floating a few meters below the surface of the water so the swimmers were spared venomous stings. 12 swimmers set off from the Bico do Simão point of the Areia Larga Beach of Pico Island at 3:48 pm with the objective to arrive at the world-famous Marina of Horta on Faial Island during the Sea Festivities which were being celebrated at the same time. The aim was to have as many swimmers as possible to complete the swim so it was not a competitive race. The first 5 swimmers arrived at the Horta Marina (not the closest point), but as the intensity of the current progressively increased, the remaining swimmers arrived at a point south of the bay at Monte da Guia (near the place where David Yudovin began his crossing in 2008). Of the 12 starters, 3 did not complete the swim due to the difficult sea conditions. "Once again, a lesson was learned with regards to planning a swim on a fixed date," said Arrobas. "The day before and the day after the swim presented near perfect conditions. Of the 9 swimmers who completed the swim, 4 swam without a wetsuit, including Letícia Toste of Terceira Island, the first woman to attempt the crossing. Apart from the goal of completing the crossing, the challenge also served to raise funds and promote the work of the Azorean Regional Chapter of the Portuguese Anti-Cancer League. The Nadar Açores Project aims to globally promote these crossings." Above photo courtesy of Rolando Marques. Para mim foi um conquistar de um sonho uma vez que sou uma amadora, alguém que simplesmente adora o mar e a natação em todas as suas vertentes. Estou extremamente satisfeita por agora fazer parte da história desse canal. Letícia Toste. I would LOVE to do this! I have family on the islands and I've spent time with those tides & jellyfish!!! I agree about not sticking to a particular date, the gentler tides are well worth the wait!! !